Alcudia. This weekend, the Raelert-Brothers start into the triathlon season 2014. Andreas Raelert is heading into the Thomas Cook Ironman 70.3 Mallorca on Saturday. For the first time he is representing the new bike partner of the Raelert-Brothers, the German bicycle manufacturer CUBE. "The race here in Mallorca is an important test for the level of shape and for the set-up of our equipment. The race comes early in the season, what provides enough time to work on any deficits," says the winner of the first edition of the Mallorcan triathlon classic. The Thomas Cook Ironman 70.3 Mallorca has grown in recent years to become one of the biggest events in the Ironman series. About 3800 starters will take part in this weekend’s event on the Balearic islands in order to celebrate a successful season opener of the European Ironman tour. "Mallorca is not only a perfect training destination for all cyclists and triathletes,” says Andreas Raelert, “the Thomas Cook Ironman 70.3 is a great event for all sports enthusiasts.” He won in 2011 the inaugural race in Alcudia, before his brother Michael secured the second title for the Raelert-Brothers one year later. In 2013 Andreas Raelert showed again a thrilling battle for the victory; at the end Eneko Llanos from Spain won the race thanks to an excellent run ahead of the Belgian Bart Aernouts and Andreas Raelert. "The Ironman 70.3 in Alcudia is absolutely a real test," says Andreas Raelert facing the outstanding list of favorites every year. When the gun goes off at 7.55 a.m. on Saturday at the beach of Alcudia, the spectators and all of the athletes will be part of an exciting Ironman 70.3 right from the beginning: First, there is the 1.9 kilometers swim in the Bay of Alcudia, before the field heads onto a technically and topographically difficult bike course of 90 kilometers, which can bring a preliminary decision. Finally, the decisive gaps will be made on the flat and fast 21.1 kilometer run course in the centre of Alcudia. "It's incredibly difficult to make any predictions before the race," says Andreas Raelert, "after weeks of training you never know where you exactly stand before the debut race of a season - and even less how strong the other athletes are. I will make every effort to be a factor in the fight for the victory." In addition to defending champion Eneko Llanos, Bart Aernouts and the former World champion on the olympic-distance, Ivan Rana (Spain), more top athletes are at the starting line. Frenchman Benjamin Sanson could be the one to set the pace during the swim as Björn Andersson from Sweden seems to be one of the best bikers in the field. 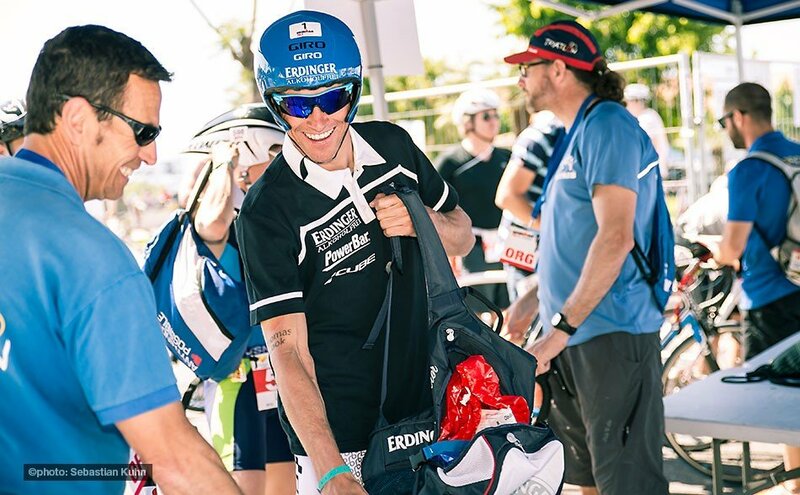 The list of favorites includes German Jan Raphael and Andreas Dreitz, who was able to celebrate his first big victory of the season at the Challenge Fuerteventura two weeks ago. Moreover the multiple world champion in Duathlon, Joerie Vansteelant (Belgium), and the British trio Will Clarke, Daniel Halksworth and Mark Threlfall are on the list of the favorites.